ADV-4800EC - 8-channel H.264/MPEG-2 HD/SD Encoder | AdvancedDigital Inc. The ADV-4800EC is a high density real-time H.264 HD/SD Encoder that can support encoding of up to eight HD/SD A/V signals. 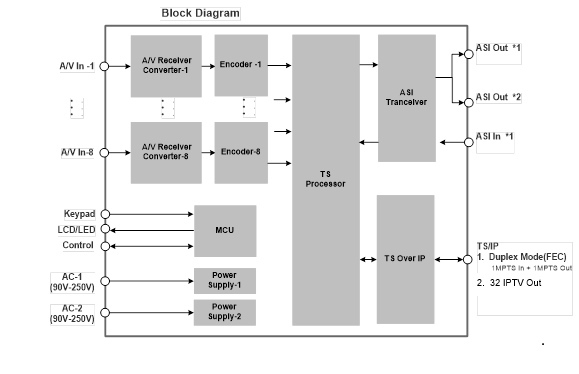 ADV-4800EC consists of two 4-Channel (total 8) H.264/MPEG-2 encoder modules. All encoders are real time and independent. The ADV-4800EC can have up to 8x HDMI or 8x SDI or 8 CVBS input ports as different factory options. The encoded streams can be re-multiplexed and output over GbE IP and ASI ports. ADV-4800EC has two TS/IP modes of operation. The first: “Full Duplex”, can combine incoming MPTS or SPTS inputs with internal encoders, and output the result over multicast/unicast. In the second mode, “IPTV Output” the unit can output up to 32 individual streams over IP. Configure, monitor and manage the device using the front panel, Web interface and SNMP.